Micro-precision sandblasting, or ‘MicroBlasting’ for short, provides a safe, consistent and precise method for burr removal on small, delicate parts with intricate geometries. Why? 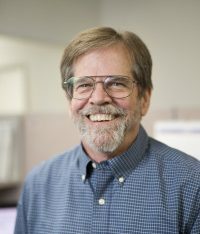 In simplest terms, micro-precision sandblasters work on a micro-scale, sending tiny abrasive particles through tiny nozzles at high velocities. The resulting abrasive stream has a laser-beam focus that is easy to aim at tiny targets. 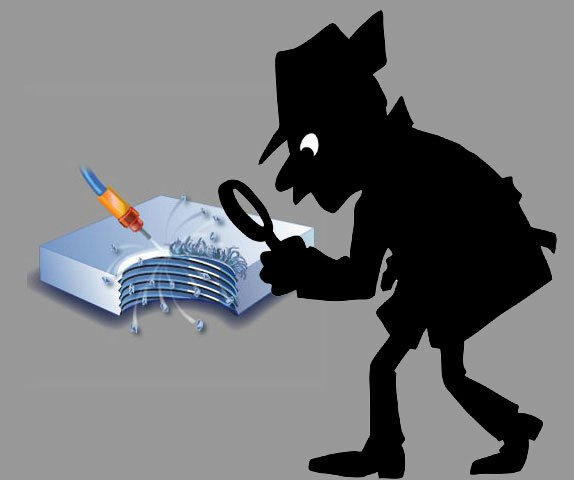 Let’s investigate and put some deburring examples under the lens. Why MicroBlasting? Most cutting methods tend to push material along the gear surface, resulting in the formation of Poisson burrs. Feather burrs also form, but Poisson burrs are ductile and cannot be knocked off like feather burrs. Instead, Poisson burrs have to be worn down at their roots using an aggressive abrasive. Aluminum oxide is one of our most aggressive abrasives available. Its particle has a sharp, blocky shape and registers at 9 on the Mohs scale. No control is lost while using aggressive media. The nozzle of a MicroBlasting system provides pinpoint focus to the abrasive stream, regardless of the sharpness or hardness of the particles. An operator can still specifically target and remove a burr without impact to part integrity. 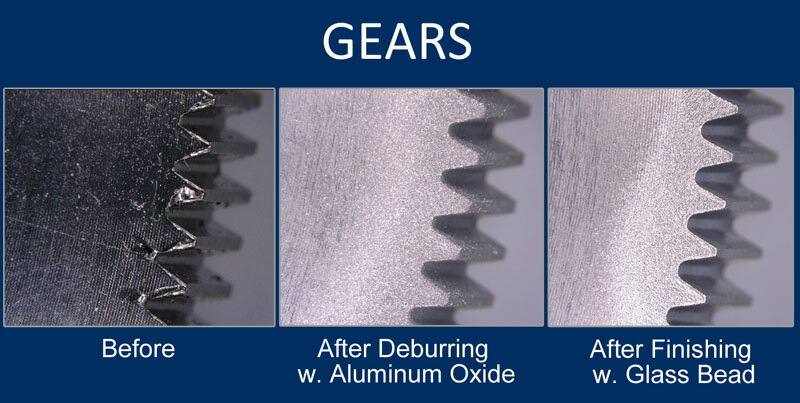 A smooth surface finish reduces friction and prolongs the lifespan of a gear. Glass bead applies a nice, satin finish. Why MicroBlasting? Biocompatibility is a critical feature of spinal implants. Sodium bicarbonate is a great abrasive for deburring spinal implants because its particles are sharp enough to cut through PEEK burrs but not sharp enough to continue cutting past the burr into the underlying surface. Low pressure, a small rectangular nozzle, and a rich abrasive stream work together to gently and cleanly strip pesky burrs off the implant’s surface to improve its biocompatibility. Picks and knives are often used on PEEK implants, but a micro-abrasive stream is easier to control and reaches smoothly into micro features where fingers and larger rudimentary tools struggle to fit. *Sodium bicarbonate is water soluble. Running parts through a simple cleaning process after deburring removes all abrasive residue. Why MicroBlasting? The flash, or burrs, that appear on electronics packages form at the seams of their molds. A bit of this material leaks out of these seams during production. This leaked material is quite thin and quite brittle. Soft abrasive, like a blunt-edged plastic media, breaks off the leaked flash without eroding the encapsulation from the electronics package. Why MicroBlasting? Machining stainless steel tends to produce fine burrs with brittle roots. Brittle material responds well to MicroBlasting efficiently. When a micro-abrasive stream is focused specifically at the root of a brittle burr, it quickly breaks the burr-free from the base material. Aluminum oxide works best for this application because its particles transfer energy from the air stream to this substrate successfully. After a pass on the outside of the valve with the 0.030″ Hi/Performance nozzle, a right angle nozzle can be used to reach deep inside of the main bore. Blasting towards the outside of the valve assembly hits all the burrs at every angle. *Aluminum oxide leaves a matte surface finish. Polishing or finishing removes this finish quickly. Why MicroBlasting? 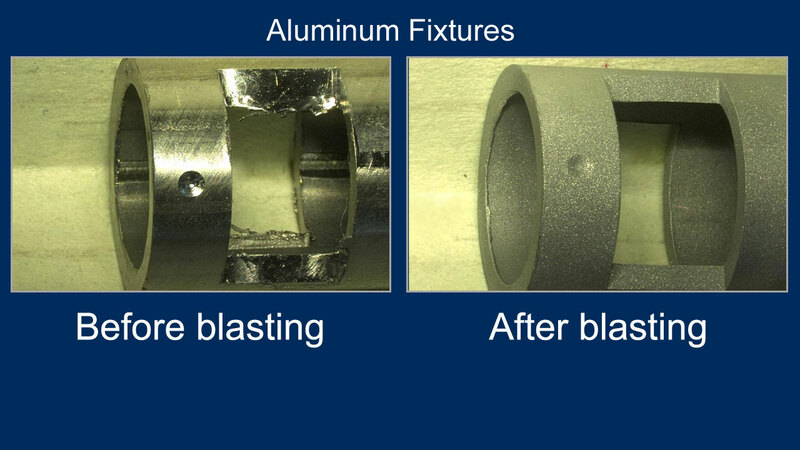 Aluminum generally requires a more aggressive abrasive than the applications above because it is a ductile material. But machining causes a small amount of the part’s material to smear and heat up at the edge, creating a rollover burr. The rollover burr, thanks to the heat, becomes brittle, which makes it easier to remove at the root. Aluminum oxide has sharp, block-shaped particles that easily cut through metals, hard surfaces, and brittle parts. Aluminum oxide works fast on metals, especially on large parts. If the part’s surface needs to be restored after deburring, switch out abrasives and run a pass with glass bead. Glass bead should gently tap a nice satin finish on the part surface. Why MicroBlasting? Small rollover burrs form on the top of this curved part-surface during machining. Surface finish is critical on a titanium component and a connector used in aerospace engines. Glass bead is best for this application because it is too soft to impact the surface finish on the area surrounding the burr. The spherical dimensions of its particles transfer energy from the air stream to the part surface, whereupon impact, it breaks off burrs. A glass bead is not sharp enough to cut into the material beyond the base of the burr. Rather, it leaves a satin finish in place of the burr and on the surface surrounding the burr site.